Personalizing your Linksys Wi-Fi Router’s wireless settings enables you to limit the number of internet users in your network. Using your Android™ smartphone, you can change the wireless settings of your router and log in to its classic web-based setup page, allowing you to change its wireless network name (SSID) and network key or password. Make sure that your Android™ smartphone is wirelessly connected to your Linksys Wi-Fi Router. The web-based setup pages differ depending on your Linksys Wi-Fi Router's model. The examples shown below are from a Linksys E1000's web-based setup page. On your Android™ smartphone, open a browser. Enter the IP address of your router in the Address bar and tap Go. NOTE: The default IP address of a Linksys Wi-Fi Router is 192.168.1.1. Enter your login credentials and tap Sign in. QUICK TIP: The default password of your Linksys Wi-Fi Router is admin with no username. However, if you changed the router password, then use that instead. NOTE: If you lost or forgot your router password, you may need to reset your router. However, resetting the router will cause its current settings to be completely erased. To know how to reset your router, click here. To learn how to set up your Linksys Wi-Fi Router using Linksys Connect, click here. 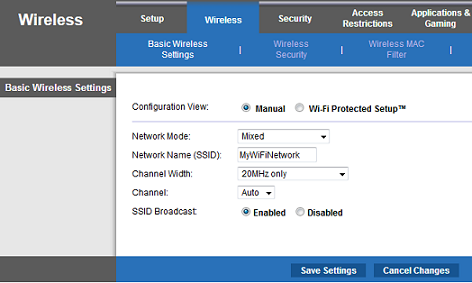 Go to Wireless > Basic Wireless Settings and select the Manual radio button for Configuration View. On the Network Name (SSID) field, enter your new network name then tap on Save Settings. Go to the Wireless Security sub-tab, then tap to select your desired Security Mode. 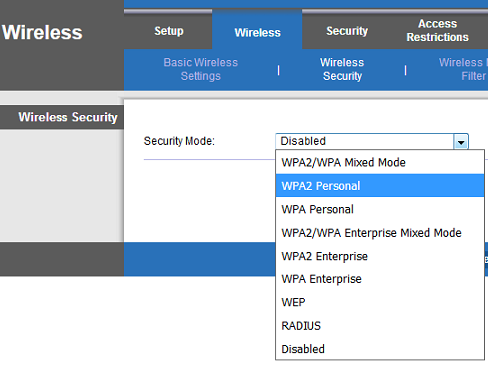 NOTE: WPA2 Personal is used in the example below. 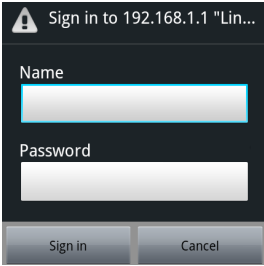 Enter your Wi-Fi password in the Passphrase field then tap Save Settings to apply the changes. NOTE: Your Android™ smartphone will be disconnected from the previous Wi-Fi. Locate your new Wi-Fi name from the list of networks and connect to it using your new Passphrase. For instructions on how to reconnect your Android™ smartphone to the Wi-Fi, click here. To reconnect your wireless computers, click here.